Four years ago, Mitch Chalmers from Midsomer Norton near Bath suffered a spinal cord injury while taking part in a motor cross event. At the time Mitch was employed as a plasterer and spent any spare time and weekends taking part in events across Europe. Mitch admits that after being discharged from hospital he shut himself away for a while as he came to terms with the life changing effects of his accident. However, after a while and with the help of family and friends he started thinking about his next career. 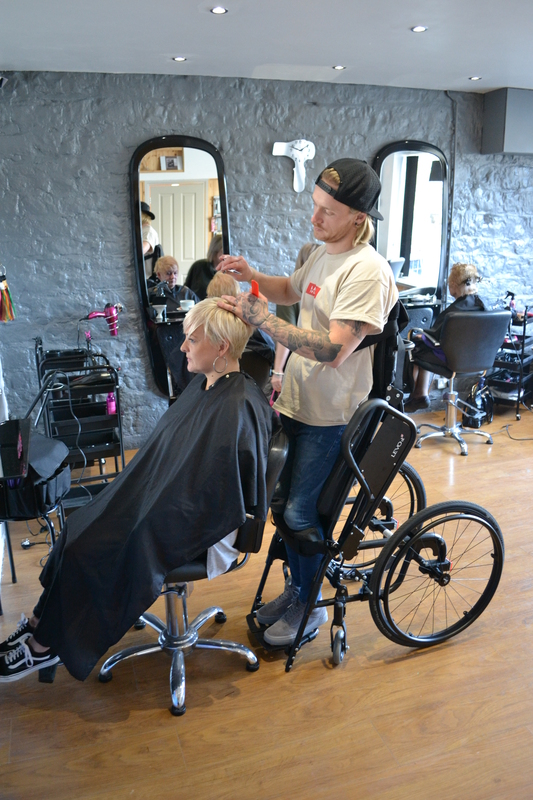 “I had always had an interest in hairdressing and thought this might be a good career, but there was one issue – how would I be able to cut hair from my wheelchair”. Determined to find a solution, after enrolling in a hairdressing course at nearby Bath College and arranging a placement at nearby Jo Jo’s hair salon, Mitch got in touch with the team at Gerald Simonds to see if they had any suggestions and was delighted when he was told about the LEVO active-easy which is a wheelchair which converts from a sitting to standing position. “As soon as I tried one out for myself I knew I had found the answer and that I could forge a career in hairdressing, so set about raising the money to buy one”. Mitch created a local fund-raising page and with the help of friends and family arranged various fund-raising events. Bath College, where Mitch is studying hairdressing also helped with events and within four months Mitch was contacting Gerald Simonds to order the wheelchair which he knew would change his life. The LEVO has been designed to smoothly elevate the user from a sitting to standing position of up to 85 degrees with the minimum amount of effort, to enable users such as Mitch to interact with people from a standing position. With seat widths ranging from 13.8” to 18.9”, a seat depth of up to 21.3” and a maximum user weight of 265lbs, the LEVO is suitable for most wheelchair users looking for an alternative to a standing frame. Prior to taking delivery of his LEVO, Mitch had been using a standing frame as he was required to stand for a certain amount of time each day as part of his ongoing physiotherapy programme but often found this uncomfortable. “When I was using a frame, I could only stand for about 10 minutes at a time, but since using my LEVO I can now stand for up to two hours, which is not only great for my hairdressing training, but also my daily physiotherapy as it means I can literally kill two birds with one stone” continued Mitch. Not only has the LEVO enabled Mitch to start training to be a hairdresser, it has also had a profound effect on him physically as he further explains: “As anybody with a similar spinal cord injury will know, managing the bladder can be a major issue. However, since I started using my LEVO wheelchair and standing for longer periods of time my bladder has started to act in a completely different way. I can now hold much more urine which is great and being stood for longer has also meant I never have any leaks, which can be another common occurrence for people with my injury”. Mitch was recently due to undergo another series of Botox injections in hospital to help stop his bladder wall from spasming, which can cause leaks, but thanks to the LEVO and standing so much this was no longer required and his doctor cancelled the procedure. A final word from Mitch: “The LEVO is just fantastic and has literally changed my life! It is extremely easy to use and manoeuvre when in the sitting position, and transferring to the standing position is quick and effortless and literally takes seconds. In addition to my hairdressing, the LEVO allows me to cook, make drinks and just talk to people face to face and enables me to feel ‘normal’ and remain independent which is all anyone in a wheelchair wants. It is also incredibly comfortable in comparison to my previous chairs. The seating position is substantially higher than most wheelchairs and I no longer have to endure the back ache which I had to previously. I also love the fact that the LEVO is so lightweight and stylish, and would not hesitate in recommending one to anybody who is looking for a wheelchair in which they can also stand”. “It is so rewarding to hear what a positive impact the LEVO has had on Mitch’s life. The way Mitch has set about forging a new career for himself with the help of the LEVO is truly inspiring and an inspiration to all of us, and on behalf of everyone at Gerald Simonds I would like to wish him the best of luck with his college course and future, as he embarks on the latest chapter in his life” commented Doug Robinson, Managing Director, Gerald Simonds. Established in 1983, Gerald Simonds is one of the UK’s leading suppliers of high quality lightweight manual, powered and standing wheelchairs, seating and pressure care products. For more information visit https://www.gerald-simonds.co.uk/.